I don't remember where I first heard about Cambridge's Pocket Cross-Reference Edition, but after the second or third rave I decided to check it out. Two problems: this edition isn't available in the United States (where the niche seems to be filled by the slightly larger but thinner Pitt Minion Reference Edition), and it's only available with the New International Version. Nothing against the NIV, I just don't use it that often. When I want a literal translation, there are better options to choose from like the ESV, NRSV, or the NASB, and when I'd like a more figurative reading, there's the REB, the NLT, or (at the extreme end) The Message. The NIV seems to occupy the middle of a spectrum that I tend to be on one side or the other of. Plus, it's not the official translation used at my church. So in spite of its popularity, I don't have as much experience with it as a lot of my fellow evangelicals. I already had a nice Cambridge NIV New Testament, so I wasn't sure I could really use a Pocket Cross-Reference Edition. That, my friends, was before I went online and looked at the photos. When I finally did, I saw red. Literally. As I've told you before, I have a profound affection for all things red, and finding a red, hand-sized Bible these days is a bit of a challenge. So in spite of the fact that it would have to be shipped from the UK, and in spite of the fact it was an NIV, I decided to give the Pocket Cross-Reference Edition a chance. Cambridge uses only bonded leather which is made from 100% real leather fibre, reconstituted with a strong resin bonding. That is simply the best quality bonded leather available – supple, handsome and durable. That didn't sound too bad, although the part about resin made me wonder if that was another way of saying it feels like plastic. For days -- okay, maybe it was just hours -- I agonized over the decision. The exchange rate being what it is, this bonded leather Bible was going to cost me. It ran about thirty-five pounds sterling, and since I'm no math wizard I just double the number to figure out the cost in dollars -- which is proving to be a more accurate equation than it was when I started using it. So I'd be putting out a little under $70 for a bonded leather Bible. Would it arrive on my doorstep and prove stiff as a board, unusable? Was I crazy? In a moment of weakness, I decided to find out. To make a long story short, I have few regrets. The form factor strikes me as pretty much ideal. The measurements on the Cambridge site are 6 x 4.25, but I come up with 6.5 x 4.75 -- maybe the difference between the page size and the cover. Width is about an inch. Personally, I appreciate a certain thickness in a small Bible, because it helps to fill the hand (and makes it more likely that the thing will open flat). The binding, of course, is sewn, and that makes a difference. In the photo at left, you can see just how willing the Pocket Cross-Reference is to open flat. Aloft on fingertips, it opens wide, and there's enough flexibility in the cover to make it comfortable in the hand. 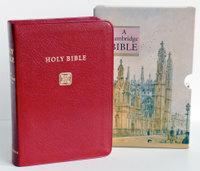 Perhaps the Cabra bonded leather is a little stiff, but it is not as stiff as the cover my my New Cambridge Paragraph Bible, and certainly not as bad as the cardboard "genuine" leather boards I'm always complaining about. It actually feels good. The grain is a little too regular. There's a bit of a shine to the surface. But you know what? I'd stack this up against comparably priced Bibles from other publishers any day. It's unique, handy, and well designed, which is more than can be said for most. Here's my theory. If you set your type in a clean, modern font, and put it in a hand-sized format, taking care that the cover is sewn and not glued, you can't go wrong. I don't care what the cover is made of, a Bible with those characteristics is going to make an impression. Form follows function, and good typography, a small format, and a sewn binding are all components of usability. The Bible, more than any other book, is meant for hard use. Small Bibles these days often feel terrible in the hand. The type is poorly chosen, the form factor off, the binding glued. You open them and they want to stay shut. (Think about the symbolism for a moment.) The Pocket Cross-Reference Edition may be bonded leather, but it's the best bonded leather I've come across, and it gets the other things absolutely right. The text is set in double columns. It's traditional, but too bad. The proportions of the page would actually suit a single column text, and Cambridge has actually offering a beautiful (albeit large) single column setting of the NIV for years. Their REB New Testament is a setting I've actually given away as an example of what single column settings should look like. The translator's preface at the front of the Pocket Cross-Reference Edition is set in a single column, teasing us with what might have been. Still, the interior design of this little Bible is excellent. The font is 6/7 pt. Olympian. Small, yes, but readable. Hand-sized Bibles are for the reader, though, emphasizing portability, and there are always trade-offs like this. The references are in the center column, which is set off from the text by dotted lines, which gives them a lighter touch than the solid (and often too thick) lines used in some recent settings by other publishers. I haven't seen dotted lines used in this way elsewhere, and it's an interesting effect. Throughout the text, references to parallel passages are included beneath section headings. For example, in 2 Samuel 24, where David counts his fighting men, there's a note referring to 1 Chronicles 21:1-17, where he's doing the exact same thing. In the Gospels, these notes serve as a running harmony. By placing the references under the text headings, the parallels are emphasized much more than when they're located in the center column. I hadn't encountered that feature before, and I like it. Since looking up parallels is the most common thing I do with a reference Bible during church, I find it particularly convenient. A few years have passed since I first bought this Bible. Because of the translation, I use it infrequently, but then, I'm not your typical reader. If the New International Version is your translation of choice, and if you're looking for one Bible that can serve for personal study and use in church, the Pocket Cross-Reference Edition would make a great choice. If you don't share my fascination with red, you could spend a few more dollars and upgrade to the calfskin in russet (think tan or brown), which strikes me as a splendid choice. 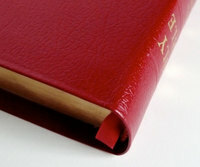 But with the sewn binding and the superior bonded leather, I think you'd get years of use out of one like mine. It does exactly the things I'm always harping about here: opens flat, feels good in the hand, and features a design that's easy on the eyes.